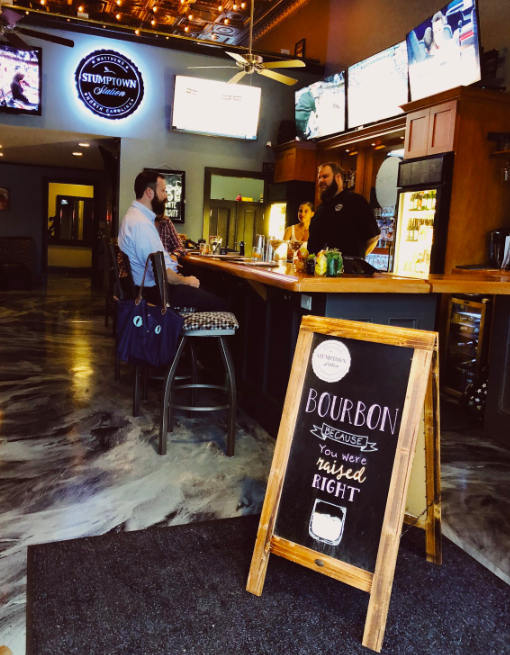 A private club located in the heart of downtown Matthews rests just feet away from your favorite shops and restaurants at the intersection of Trade and John Street, namedStumptown Station. There are roughly sixty five distilleries in North Carolina and they take pride in representing at least 20-30 of them at any given time to feature in their craft cocktail menu. Coming up on their one year anniversary in August, since then the owners have put their blood, sweat and tears into the vision for Stumptown Station. Installing everything themselves from the solid single piece of wood for the bar (which is 18 feet long and weighs 1,100 lbs), upholstering chairs, assembling solid wood tabletops, building cabinets behind the bar, and many other little details like stringing ceiling lights. If you are unfamiliar with why Matthews is known by another name, Stumptown, here is a snipit behind it's making. 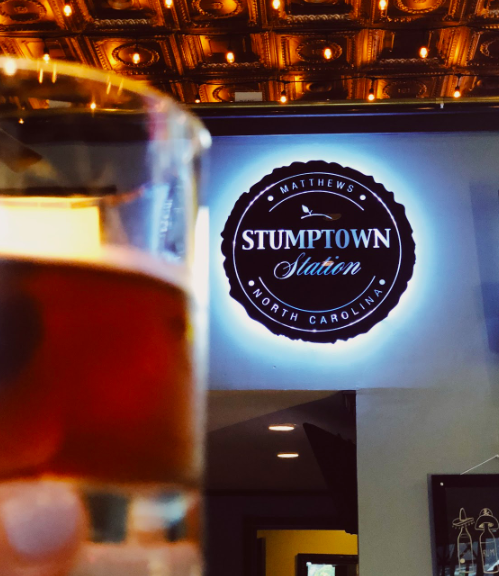 You can also read more about Stumptown Station and their mission to create a space for fantastic local liquor drinks amongst the well established beer and wine scene in town on their site. "Nestled between Charlotte and Monroe, the area now known as Matthews was unspoiled rolling woodlands with large stands of trees. By the early 1800s, this rich and inviting land attracted our early settlers, who were mainly farmers. In the vicinity lay the trading trails, game-rich hunting grounds and the ancestral homes of the Waxhaw and Catawba Indians. These farmers began clearing the land for planting around the start of the 19th century. Cotton grew well and soon became the primary cash crop. As the land was cleared for planting, so many tree stumps were left standing that the early settlement was unofficially known as Stumptown." This twenty one and up establishment offers a wide variety of local flavors fit for any taste your mood might be after. Craft cocktails made with local spirits, fruits and herbs sourced from local markets like the Matthews Community Farmers Market just across the street on Saturdays. Bartenders also create classic cocktail favorites like an Old Fashioned, Manhattan or Tom Collins. While pouring a simple rum and coke is something they do, what inspires them most is being able to share their knowledge of spirits, their history and new cocktail creations. You might come in looking for the old familiar but likely leave a bit more experienced. Their Flagship cocktail is made with only the best from what's around. Rua, American Single Malt Whiskey aged in American Oak Barrels, fromGreat Wagon Road Distilling in Charlotte,Oak City Amaretto from Raleigh, house brandied cherries, finished with the rind of an orange served over a large ice cube. Pictured: bottom left. Stumptown welcomes outside food. Bring your own or order from Seaboard, Pizza Peel, Moe's BBQ, Pita Kabob, Cafe 157, even Jimmy John's, most will deliver. There is nothing wrong with eating a nice steak dinner out of a to-go box as long as it's paired with a fancy cocktail. Make your own happiness! With just a few weekly specials to keep you entertained they also host live music on the fourth Saturday of every month. Monday ~ Mystery Beer/Bartenders Choice, Thursday ~ Margarita, Sunday ~ Half Price Drafts (only 6 taps). There are two levels of membership. Five dollars gets you and four friends in the door to enjoy yourselves, or you can upgrade to VIP for $30 and receive your very own custom engraved heavy cocktail glass plus discounts for ticketed events such as Valentine's Day or New Years Eve. Join them (and us) today, become a member here. A warm thank you to Brandon & his team for hosting us for the evening. Eric and I will see you reaaal soon.